The 5th Kings Tournament will be held in Medias, Romania, from June, 10th to June, 22. ChessOK is going to broadcast all games of the tournament with Rybka Aquarium commentary. 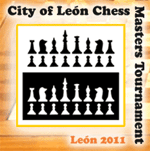 The 24th Leon Masters tournament will be a match between Viswanathan Anand and Alexei Shirov. Two games will be held per day during June 3rd-5pth with a time control of 45 minutes + 30 seconds per move. If the match is tied 3-3, then there will be blitz and armageddon tie-breaks if required. ChessOK will broadcast the match live.